This seemed to be a pretty popular post last summer, so I'm going to repost for you since we're in the height of summer. I'm still really busy with the new job - which doesn't seem so new anymore - so I thought I'd repost a few things from last summer until I find time to create some new posts. 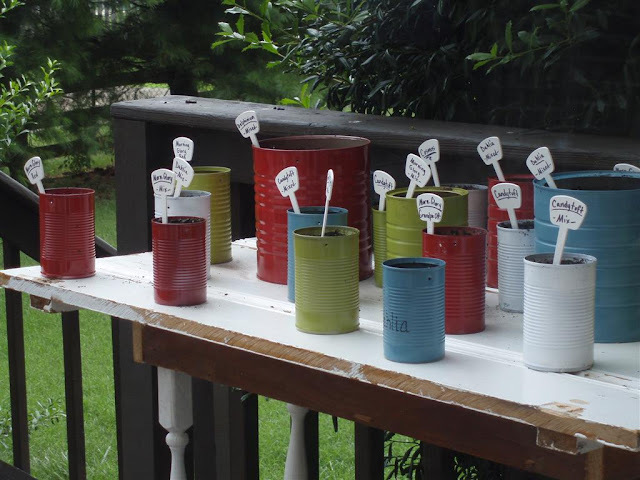 Grab that load of tin cans you've been stock piling - I've got an easy-peasy project for you. 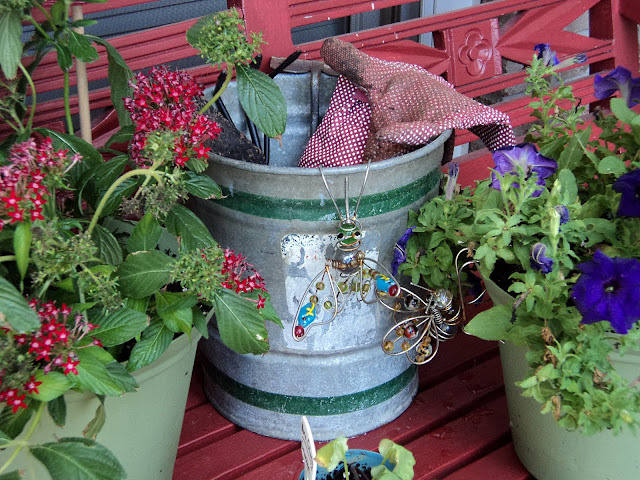 I've seen tin can everything around blogland lately, and there are many great projects out there to be inspired by. One day I'll make my way through them all. For now though, I just needed to do something with the ones I've been saving that were beginning to create a moat around my kitchen counter. I decided to plant flower seedlings in mine. I needed a place to get them started, and this was the perfect solution. It's a quick project that uses up several cans at one time. 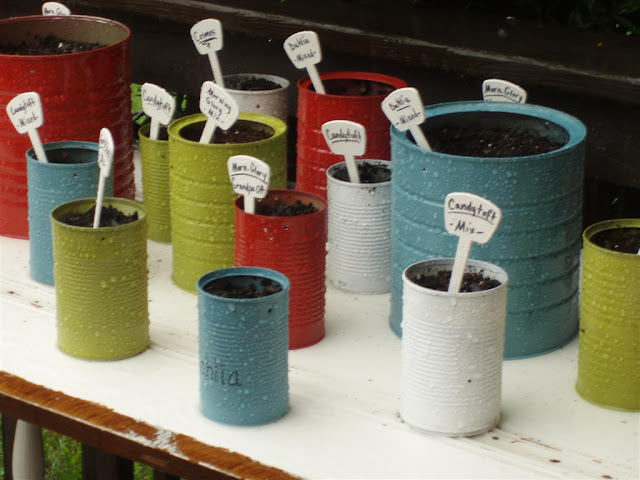 You'll need cans, spray paint, seeds, a drill bit (or hammer and nail), potting soil, and some sort of identification stick. I used actual flower markers that you can write on. Ok, so I painted my cans before I took a picture of the supplies. I'm assuming you all know how to spray paint a can by now, right? 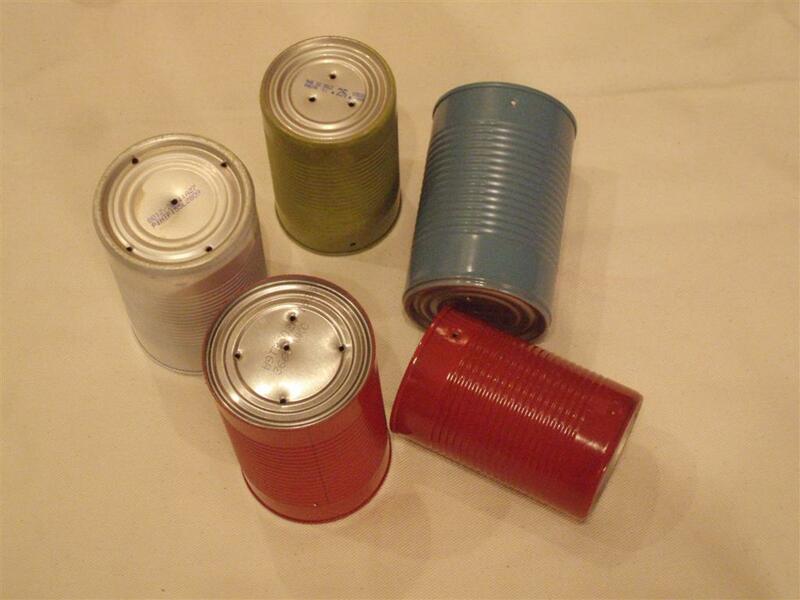 Anyhoo, first, I painted all of my cans in various colors. All the colors are Krylon. Next, let the cans dry completely, and then punch a few holes in the bottom for drainage. If you have a drill, just use a small bit and do your holes. If not, punch them with a hammer and nail. 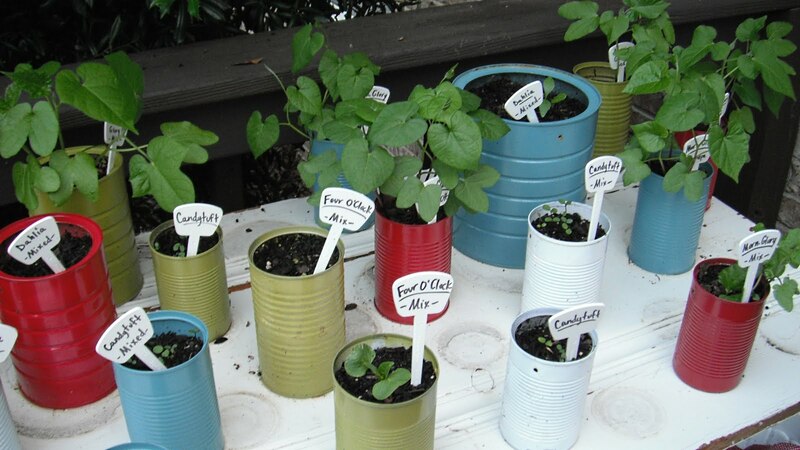 Then, load them up with potting soil and put your seeds in. Be sure to keep up with which seeds are in which cans so that you can label them properly. I planted one type of seed at a time and then made my markers so that I wouldn't lose track of what was where. Aren't the colors fun and happy? TIP: I always put my potting soil in a bucket and wet it down before I fill my cans. This way, the soil is already packed down and your seeds won't shift or float to the top when you water them afterwards. I put them on an old table and then sat them on the deck. The next morning it was raining so I checked on them to see if they were flooding, and here's what they looked like. The water droplets are so pretty on the colored cans! And here they are 8 days later in the morning sun - already flourishing! I check on them every single day, especially during this heat wave!). At this rate of growth, I'll be able to transfer them into larger containers or into the ground and start all over with a new batch really soon. I'll definitely be doing this every year now. Update: Here are a few of them in full bloom, transferred to even bigger tin cans! 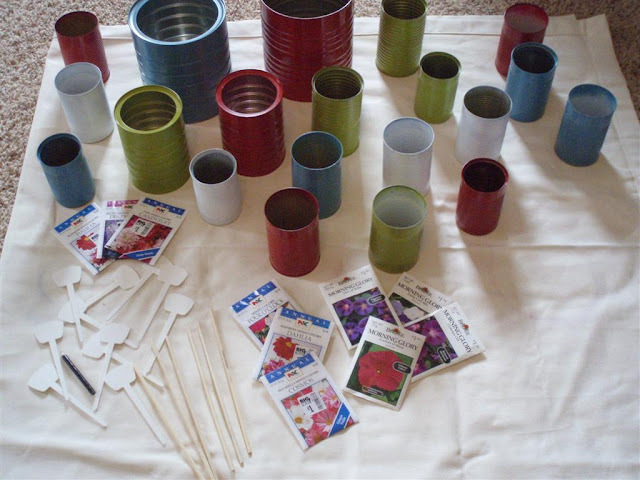 So tell me, what have you been making, planting, or sewing this summer? Hi Polly! It is good to see you post. I am glad the job is still going well. I look forward to when you are able to post new stuff. In the meantime take care. Glad to see you back for a minute. Miss seeing you on a regular basis but understand. Have a happy week. I haven't planted anything yet...but I have some fresh new topsoil and some wonderful pots. So I hope to be planting this weekend!! Great idea to do with the grandkids. Love the painted cans too. Hope all is going well with you. I really miss your posts, but understand life gets in the way sometimes. My hubby and I have been living 3hrs away during the week and then home on weekends, so life is hectic here too. But we must do what we have to for work right now. Wow, you have a green thumb. Love the recycled cans too! what a great post and sooo colorful thanks for sharing..